The world over, most of the time gold is minted into one ounce rounds or coins. This consistency is great most of the time. However, their are some unique benefits to buying gold coins in smaller sizes. Holds .25 troy ounces of .9999 pure gold bullion. As a legal tender coin, the Canadian Government guarantees these coins for their weight & purity. Additionally the Canadian Government pursues and prosecutes would-be counterfeiters. The Royal Canadian Mint is one of the premier mints in the world. Manufactured at the Canadian Mint in the year 2019. High liquidity among investors due to the Royal Canadian Mint’s global reputation. Legal tender value of 10 Canadian Dollars. Individually shipped in vinyl flips. Mutiples of 20 are shipped in sealed plastic sheets. So what are some of the unique benefits to buying gold in ¼ troy ounce size? The first is you’ll have four times more control when it comes time to sell when compared to a more common one ounce gold coin. Investors who believe the price of gold will be much higher than it is today desire this control because it means you’ll be able to sell in smaller batches. Instead of selling off one whole ounce, you can sell ¼ ounce and have more control over how much currency you want at any one time. Buying gold in case of an economic emergency? You aren’t alone. Many investors buy these smaller coins over their 1 ounce counterparts precisely because they are preparing for emergencies. 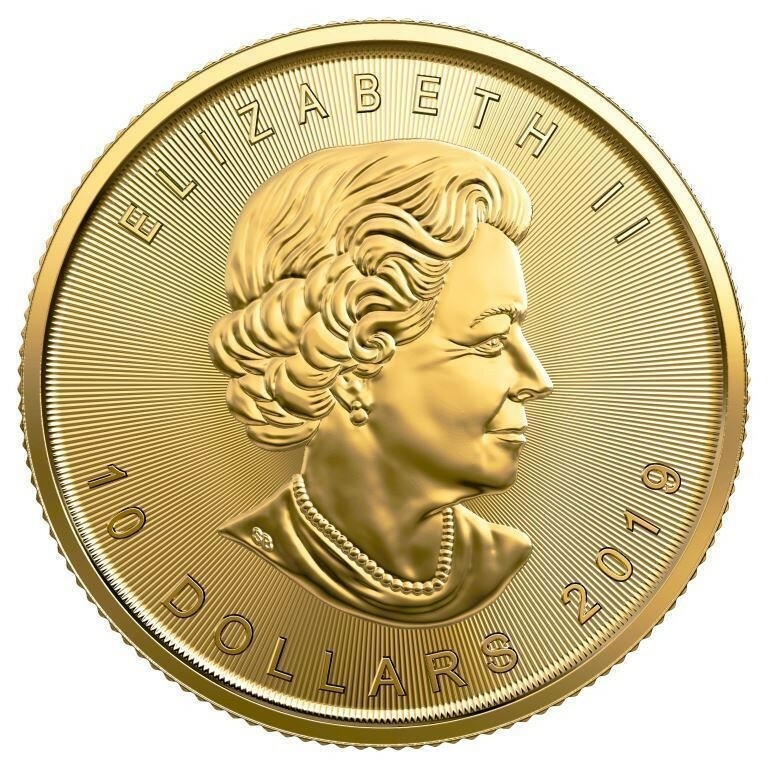 Basically, these investors believe that ¼ ounce gold coins, even down to 1/10 ounce, will be useful to barter with, or to simply sell to a local coin shop in case of a banking holiday. If you had to use these coins in barter trade, they would work well as they have all the information stamped on them to facilitate such a transaction (weight, purity, and precious metal type). Whether this outlook holds any credence or not is up to the individual investor, but that is one of the primary reasons people purchase this particular round and other fractional gold rounds. 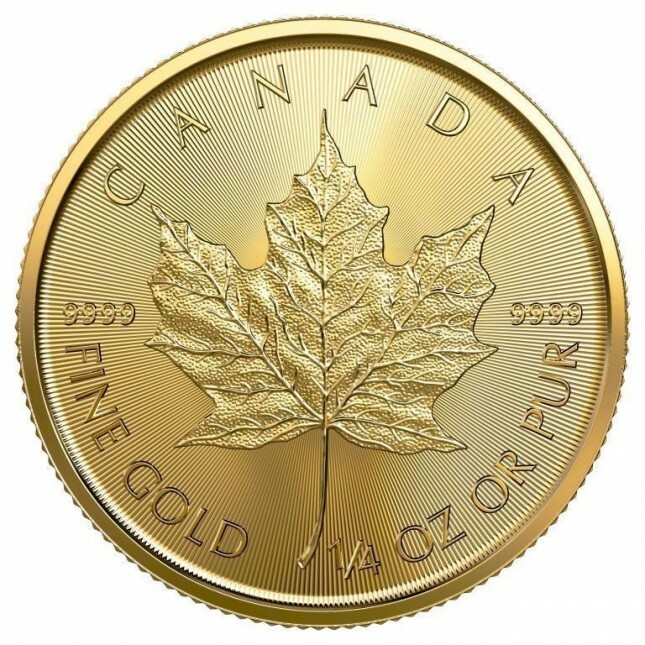 Apart from these coins' size, they are normal bullion coins like their larger Gold Maple counterparts. Which means their value is driven by whether the spot price of gold has gone up or down. This simplicity is key to many investors who don’t want to deal with coin condition, or collector certifications. They just like to keep it simple. The design on this coin is the classic Canadian maple leaf. Around the maple leaf are the words “CANADA”, “9999” stating the purity of 99.99%, “FINE GOLD 1/4 OZ OR PUR” stating the metal type and weight. On the reverse side is the portrait of Queen Elizabeth the 2nd. Royal Canadian Mint Coins have a world wide reputation for quality making these coins some of the most liquid gold bullion products available. Finally, the smaller size also makes it affordable if you are buying gold on a budget. All orders from Monument Metals are discretely shipped, fully insured, and guaranteed as described. As Low As $26.99 Over Melt!